When I first met my mother-in-law Jane, I was told that one of her nicknames was "Hurricane Jane." It wasn't difficult to understand why. Jane was a whirlwind of energy back in the day, a head-strong, vocal, opinionated woman who had no compunctions about sharing them. She told you like it was -- or like she saw it. Sometimes, that rubbed folks the wrong way. But hurricanes eventually lose their strength. Shortly after Jane moved in with my husband, my daughter and me for the last time, he was aiding his mother to the dinner table one evening. "Come on Jane," Marty said, urging her along. "Hurricane Jane, I think you've been downgraded to a Tropical Depression." But even to the end she was the same old Jane. Even as she battled time and whatever ailment that was attacking her frail little body in her final hours, she put up the good fight, refusing to let go. Even to the end she proved to be contrary. And even as her mind began to wander, her thoughts began to ramble, and her eyes became unseeing to what was happening around her, her voice never gave up. In other words, she never stopped telling it like it is -- or how she saw it. Her bed was uncomfortable: "What? You can afford a pool but not a comfortable cot? She was ever the Baseball Mom: "This team didn't even show up today." And a critic: "These umpires are terrible." And, maybe, a little scared: "If I don't pray, I'm going to hell." She had spent only one week in the nearby nursing home The Coach and I had moved her to after her needs exceeded our capabilities. She didn't want to go, but after only a day or so of digging in her heels, even she knew that she needed more care than we could give her. On my last day as her full time caretaker, I was practically carrying her to the bathroom. The next day, she could no longer walk. So the paperwork was quickly done and I began packing for her move. But I never even got to finish moving her in. Half her closet was empty. We never got to hang pictures on her wall. After just seven days, she became ill. The staff called us in the middle of the night to tell us they were taking her to the hospital. The next night they called to ask Marty if she had a DNR in place, and the doctor wanted to meet with him in the morning. So on Saturday morning, The Coach left the house in full baseball uniform, but instead of heading to the ballpark, he went to the hospital. He met with the doctor on duty,who explained that Jane's body was shutting down, her end was near, that it was time to begin our goodbyes. In tears, Marty started calling and messaging the rest of us. Soon enough, her grandchildren, her former daughter-in-law and her present one gathered around Jane's bed and tried to make sense of what she was saying. "11:30," she kept saying. When my husband's first wife asked what that meant, she replied, "Happy Hour." That surprised none of us. We were surprised an hour or so later when her regular doctor came in, took a look around and wondered what the heck we were all doing there. "It's not time for this," he said. "She has an infection. We're giving her antibiotics. She's OK."
So I took my Teen home to go back to bed. And the Coach left to go to the baseball field. His departure may have been her last moment of clarity. "Bye, Mom. I'm going to the ballpark for a while," he said, leaning over to kiss her forehead. My stepdaughter stayed a while and listened to her grandmother ramble on about the election of 1915, which, Jane said, was won by the Priest's son. So was the World Series. (Jane was born in 1930.) 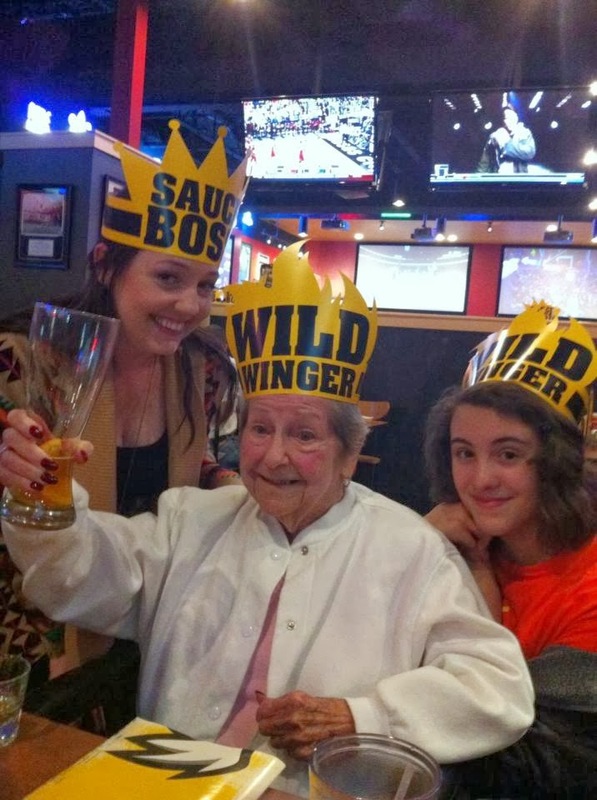 She also was presented with a nurse's challenge to feed her nearly comatose grandmother baked chicken and corn for lunch. After securing the pre-season victory, The Coach returned to the hospital. Now his mother seemed to be in pain. A nurse offered a shot of morphine -- to her, not to him. And a few minutes later, she simply slipped away, doing it her way to the very end. Stunned, mystified, Marty sent the family a text. "It's Pappy's turn now. Jane has passed." On February 25th, we gathered to say our last goodbye to my mother-in-law, Jane. It was left to me to select a sampling of our favorite photos, so I picked the ones I thought best represented the woman we all knew. Most of them involved some kind of costume -- "Old Ariel" is legendary. 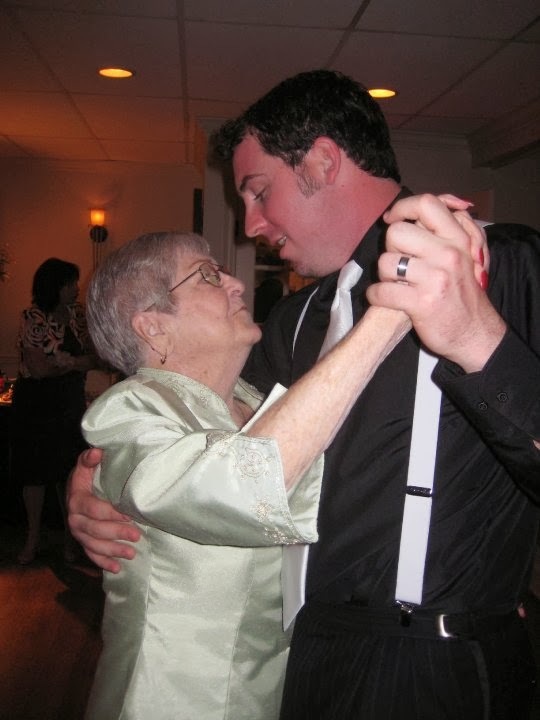 But there also was one of her dancing with her grandson at his wedding, holding her great-granddaughter, in front of what was once her home after the real hurricane destroyed it. And the one we selected for her obituary. It was left to me to write that too. Jane Mae Rafferty Luquet, wife, mother, grandmother, great-grandmother and Baseball Mom, died on Saturday, February 15, 2014, at St. Charles Parish Hospital in Luling. She was 83. Born on November 24, 1930, in New Orleans, Jane was the youngest child of George "Red" Rafferty and Martina Daly, and joined a host of Irish Channel cousins. In 1951, she married Valsin "Pappy" Luquet and soon became the mother of three boys, all of whom would grow up to be baseball players and coaches. Married to Pappy for 57 years, his work moved them from New Orleans to Anaheim, CA, to Concord, CA, to Chicago, ILL, to Charlotte, NC. 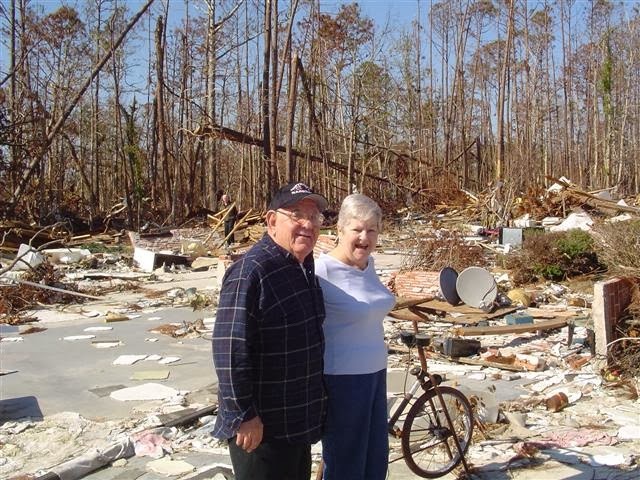 Eventually, they would retire and settle in Waveland, Mississippi, where they lived happily until Hurricane Katrina destroyed their home. They lived in Norco and Kenner before Pappy died in 2008, then Jane moved to The Windsor Senior Living Center in Mandeville. For the past year Jane lived in Norco. She is survived by sons Valsin Luquet Jr. (Deidre Digel) of Montgomery, Texas; Dennis Luquet (Marianne Carroll) of Walnut Creek, California; and Marty Luquet (Lori Lyons) of Norco; grandchildren Daniel Luquet (Cori Southard), Courtney Luquet, Lora Leigh Luquet, Gared Luquet and Caitlin Luquet; great-granddaughter Robi Drew Luquet; brother Steve Rafferty of Kenner; sister Alice Rafferty Brechtel of Metairie; and a host of nieces, nephews and cousins. She is preceded in death by her husband Valsin Paul Luquet Sr., her parents George and Martina (Daly) Rafferty, and her great-grandchild Parker Luquet. A fiery, fun-loving Irish woman, Jane loved parties, baseball, card games, Happy Hour and her family's annual St. Patrick's Day celebration. A Funeral Mass will be held at noon on Tuesday, February 25, 2014 at Sacred Heart of Jesus Church in Norco. Visitation will be held at the church from 10 a.m. to funeral time. Arrangements by H.C. Alexander Funeral Home in Norco. As Louisiana'ans, we are accustomed to hurricanes. We know how to prepare for them, we know how to anticipate them, we know how to weather them. That's what my family and I have been doing for the last 16 months - hunkering down as we weathered the storm that was Hurricane Jane. Our forays out of our compound were brief and near -- occasional sandwiches at the local Pub for the most part. Longer trips required getting a sitter -- hard to come by for the elderly. Only one relative ever offered to come stay with her to give us a break. A few times she went to visit her sister and niece for a weekend to give us respite. Marty's brother, Dennis, came during the summer to let take a quick trip to the beach. I cannot remember the last movie Marty and I went to together ("Silver Linings Playbook" maybe?). I absolutely cannot remember the last movie the three of us went to. But now the storm has passed, and Marty, Lora and I are clearing the debris and making necessary repairs and trying to move on. It's an adjustment, of course. Hurricane Jane certainly left her mark.